MOSCOW (AP) — The leaders of Russia and Turkey agreed Monday to establish a demilitarized zone in Syria’s Idlib region, the last major stronghold of anti-government rebels where fears had been running high of a devastating offensive by government forces. The zone will be established by Oct. 15 and be 15-20 kilometers (9-12 miles) deep, with troops from Russia and NATO-member Turkey conducting coordinated patrols, President Vladimir Putin said at the end of a more than three-hour meeting with Turkish President Recep Tayyip Erdogan in Sochi. The deal marked a significant agreement between the two leaders and effectively delays an offensive by Syria and its Russian and Iranian allies, one that Turkey fears would create a humanitarian crisis near its border. Putin said “radical militants” would have to withdraw from the zone. Among them would be those from the al-Qaida-linked Hayat Tahrir al-Sham — Arabic for Levant Liberation Committee. The group denies it is linked to al-Qaida. It was not immediately clear exactly how the deal would be implemented in the province, which is home to more than 3 million Syrians and an estimated 60,000 rebel fighters from various groups. 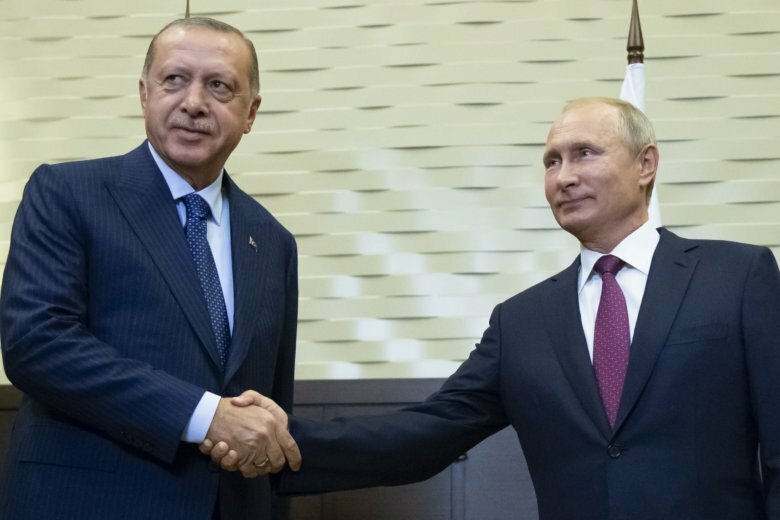 “I believe that with this agreement we prevented a great humanitarian crisis in Idlib,” Erdogan said at a joint briefing with Putin. Putin said he believed the agreement on Idlib could hasten final resolution of Syria’s long and devastating civil war. “We agreed that practical implementation of the steps we plan will give a fresh impetus to the process of political settlement of the Syrian conflict and will make it possible to invigorate efforts in the Geneva format and will help restore peace in Syria,” he said. Ahmed Ramadan, a spokesman for the Syrian political opposition in exile, said the agreement offered Russia a chance to walk back its threat against Idlib and represented a success for diplomatic pressure from Turkey and the United States, which was also against an offensive. Ramadan also said the deal offers the Syrian government and Russia one of their main demands, which is securing the highway that passes through Idlib and links northern Syria with other cities. That was one of the government’s strategic aims in an offensive in Idlib. He said the zone would be enforced by Turkish patrols on the opposition side and Russian patrols on the government side. Ramadan added that the opposition was now stronger than when it was after losses in Daraa and Ghouta. He said the Russians reached the agreement without negotiating it first with the Syrian government, pointing to Shoigu’s comments that Moscow will discuss the deal with the Syrian government later. Abu Omar, a spokesman for the Turkey-backed rebel group Faylaq al-Sham, thanked Erdogan for preventing an offensive and giving the rebels time to defend their rebellion and people. Millions “of civilians in Idlib are in peace,” he tweeted. Capt. Naji al-Mustafa, a spokesman for the Turkey-backed umbrella group of opposition fighters known as the National Front for Liberation, said diplomatic efforts have prevented a wide-offensive on Idlib but that his group still needs to learn the details of the deal. He said the nature of the demilitarized zone and how it would be implemented are not yet clear. “We need details,” he said, adding that the Assad government has broken many agreements before, including the Russian-Turkey negotiated de-escalation zones. “We will remain ready for fighting,” he said. Russia has called Idlib a hotbed of terrorism and had said the Syrian government has the right to retake control of it. In recent weeks, Russian officials repeatedly claimed rebels in Idlib were preparing a chemical weapons attack that could be blamed on the Syrian government and prompt a retaliatory strike by the West. Turkey had appealed to Russia and Iran, its uneasy negotiating partners, for a diplomatic resolution. At the same time, it has sent reinforcements to its troops ringing Idlib, a move designed to ward off a ground assault, at least for now. However, Lorraine Bramwell, the group’s Syria country director, cautioned that previous de-escalation deals didn’t last long. Idlib and surrounding areas were quiet Monday, a continuation of the calm that started less than a week ago amid Russia-Turkey talks. Associated Press writer Jim Heintz reported this story in Moscow and AP writer Sarah El Deeb reported from Beirut. AP writer Neyran Elden in Istanbul, Turkey, contributed to this report.